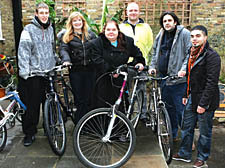 UNCLAIMED stolen bikes have been given new homes after being repaired by a team of young offenders. Members of the Camden Recycled project presented residents at the Umbrella Care Home in Camden Park Road with a windfall of expensive bicycles on Thursday. The stolen bikes were confiscated by police, then handed over to Camden’s Youth Offending Service if they failed to be reclaimed. With the help of cycle experts, young offenders are taught how to fix and maintain the pedal bikes before giving them to schools and care homes. Judd O’Driscoll, 18, who took part in the Camden Recycled project, said he now plans to open a bike shop.